The file Ultimate Combat v.3.32 is a modification for The Elder Scrolls V: Skyrim, a(n) rpg game. Download for free. 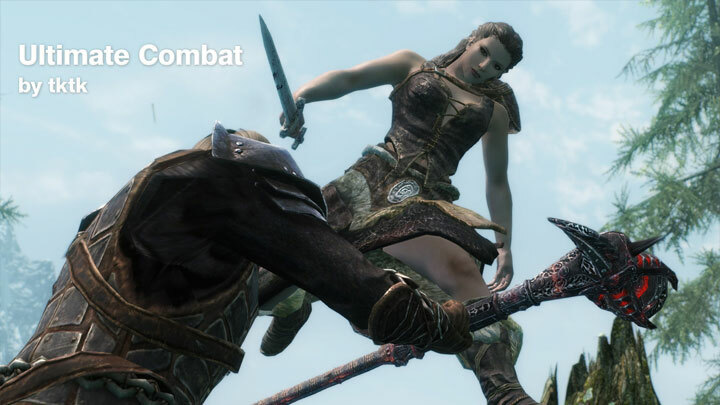 Ultimate Combat is a mod for The Elder Scrolls V: Skyrim, created by tktk. Add a lot of new attack animation. It is a unique feature of this mod. Continuous attacks, dash attacks, a wide range of rotation attacks and more various attacks. Some special attack cannot stagger during attacking. Diverse behaviors is compatible with light load by extending havok and scripted AI. Enemy NPC is fatal wound, surrounding friends run up to protect an ally. If it is a sorcerer try to recover health. Applied race:human, draugr, dragon priest, skeleton, ash spawn, dwarven centurion, falmer, giant, frost giant. High level wizards use long chanting spell than normal one. It is a wide range recovery magic, a penetrating spell or a wide range paralyzed spell. Improve boring and troublesome parts. + Significantly reduce speed and frequency of NPC's super reaction to long range attack (so-called Ninja Dodge). + Reduce turning speed and tracking performance of all NPCs. This mod adopts a new stagger system from 3.0. The poise is accumulated by poise damage value, and it gets stagger when it exceeds a certain value. Poise value recover to its maximum value when get a stagger. Every time an enemy staggers, poise value of max gradually increases. It is aimed at preventing too many staggers between players and enemies by barrier of poise. Depending on the purpose, it does not stagger with normal attacks. It relates to bash, power attack and bow attack only. Players staggers by enemy power attacks or bash attacks. Unlike vanilla, behavior is interrupted. Attacks by daggers and small animals are hard to stagger due to their low poise damage value. poise and poise damage depends on weapons, armor, weight(creature only). Calculate to existing numerical base without a patch. Heavy armor has high poise value, two handed weapons have high poise damage value. Stagger by bow is also based on poise. Enemy definitely staggers for the first time. The second time, enemy also stagger with a high probability, because the first poise value is accumulated. As long as a poise damage does not exceed total poise value at the third time, enemy may not stagger with bash or power attack only once. If player is blocking attack at the front for a short time, player don't stamina/health damage and then attacker staggers. Whether to stagger or not depends on poise value. Player cannot use it when stamina is low. You get a stop effect and blur on screen strongly when you suceed timed blocking. These can be changed settings in MCM. Expand magical shield when you charge a magic(just after pressing a button) with the timing of enemy melee attacking at the front. You parry the enemy attack, you are not damaged, and then attacker staggers depends on poise. It consumes 10 magicka on success. Possible range of parrying is limited than timed block. Bleeding/poison damage is not blocked. Both enemy and player increase/decrease damage depending on speed and direction. If player move forward against an enemy, player deal/incoming more damage depending on speed of player. Conversely, if player moves backwards, player deal/incoming less damage depending on speed. Enemy also the same affect. While enemy attack forward, player gets chance of great dealing damage, but also a risk of suffering heavy damage. Ice wraith, skeever, mud crab, dragon priest etc. Damage-up at the speed bonus is a multiplier, so you will receive more benefit from the high damage of the two-handed weapon better than dagger. Attack by player bow and crossbow has locational damage. Head: Deal additional damage. The amount of additional damage depends on the critical damage and skill of archery. Arms: Reduce accuracy rate of bow, lower physical damage and increase cost of destructive magic. Foot: Decrease attack and movement speed. Effect of the shock wave is displayed when succeeds. This feature is stable and lightweight. Arms and feet targets around knees and elbows. adds a slashing effect to player when swinging a weapon. + You can block immediately even while attacking. + Both players and NPCs consume stamina when blocking attacks. + The reach of the bash is shortened. + NPC increases speed of weapon switch and pickup. + It is safe and lightload because it distributes scripts dynamically only at the start of battle. There is no need to wait for 30 days in skyrim. + Can also be used with other combat mod etc, because I don't edit vanilla objects. I set they stronger than others for more exciting. Health is doubled by default. Magnification can be set in MCM. Adds warp, shockwave with stagger, magic beam to track target,water column at feet, water column to track target and more. Attacking on the back adds more damage. Continuing attacking the back many times will enter an error check. Centurion cannot act while error checking. Attacking with bow or ranged magic on chest adds more damage. (including the rounded part of the chest). Note:Face is ineffective. When certain conditions are met, it moves to overload mode. Decrease in physical / magic resistance. Increase attack speed and damage. There is a special attack during overload. Helath depends on player level. It will not increase much during player level is low. Maximum health magnification can be set in MCM. Increases physical attack resistance depends on player level. When certain conditions are met, giant moves to anger mode. Decrease in physical / magic resistance, increase attack damage and speed. There is a special attack during anger.